Time Beyond Place – The Cultural Bridge is a cross-cultural collaborative platform initiated by New York-based artist, Anne Senstad, for women artists that responds to the preservation of cultural and architectural heritage, domesticity and memory. 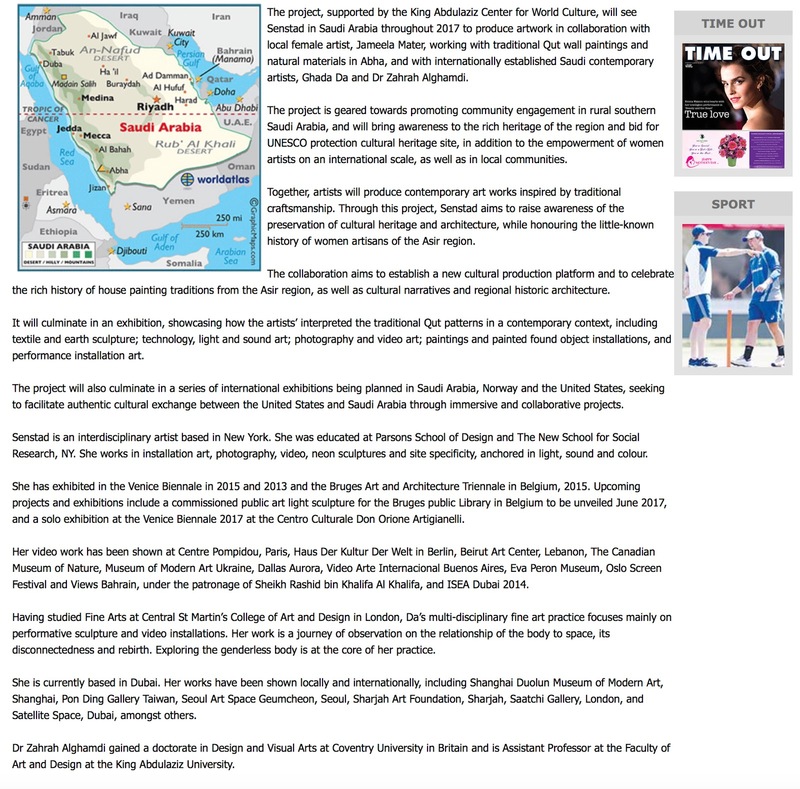 The project is part of an initiative by the King Abdulaziz Center for World Culture, which seeks to facilitate authentic cultural exchange between the United States and Saudi Arabia through fully immersive and collaborative projects. Senstad will be in Saudi Arabia throughout 2017 to produce artwork in collaboration with artist Jameelah Mater who works with traditional Qut wall paintings and natural materials in Abha and with internationally established Saudi contemporary artists, Ghada Da based and Dr. Zahrah Alghamdi. Together they will produce contemporary art works inspired by traditional craftsmanship. Through this project Senstad aims to raise awareness of the preservation of cultural heritage and architecture while honoring the little-known history of women artisans of the Asir region. 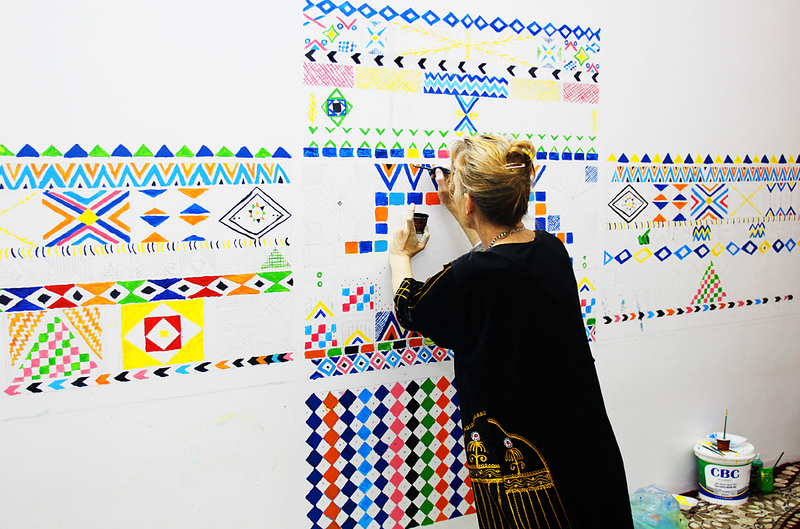 The collaboration aims to establish a new cultural production platform and to celebrate the rich history of house painting traditions from the Asir region, as well as cultural narratives and regional historic architecture. The project will culminate in an exhibition in response to the artists’ interpretations of the traditional Qut patterns in a contemporary context, including textile and earth sculpture; technology, light and sound art; photography and video art; paintings and painted found object installations, and performance installation art. 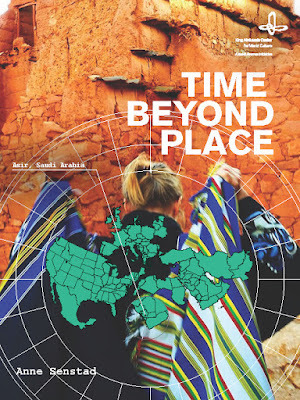 Time Beyond Place – The Cultural Bridge began in February 2016. 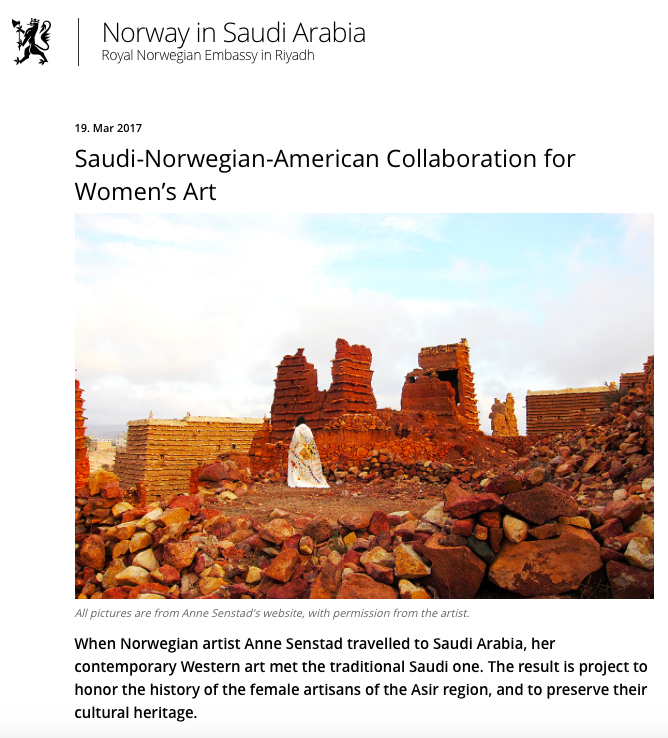 This iteration of the project will culminate in a series of international exhibitions being planned in Saudi Arabia, Norway and the United States. 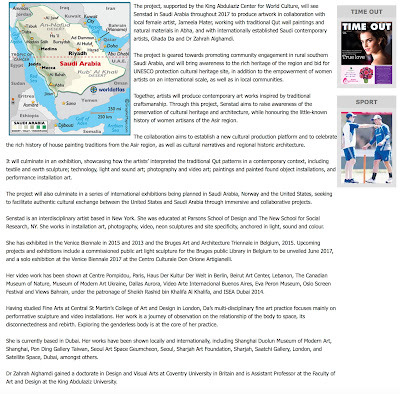 This is part of a multi-city Saudi artist’s tour of the United States supported by the King Abdulaziz Center for World Culture and CULTURUNNERS, an international platform for traveling artists. 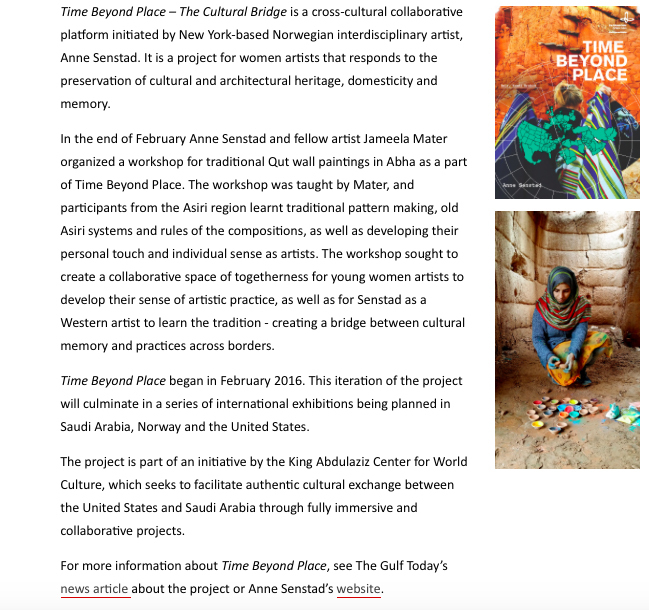 Qut Workshop in Abha Feb 22-26 2017 The workshop was taught by artist Jameela Mater and organized by Anne Senstad and Jameela as part of Time Beyond Place. Participants from the Asiri region learnt traditional pattern making, old Asiri systems and rules of the compositions, as well as developing their personal touch and individual sense as artists. The workshop sought to create a collaborative space of togetherness for young women artists to develop their sense of artistic practice, as well as for Senstad as a western artist to learn the tradition - creating a bridge between cultural memory and practices across borders. 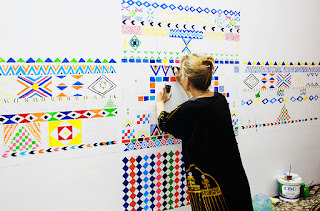 Anne Senstad is an interdisciplinary artist based in New York. She was educated at Parsons School of Design and The New School for Social Research, NY. Senstad works in the intersections of installation art, photography, video, site and performative specific work, text interventions and land art. She is concerned with sensorial aesthetics, perception and transformative ideas of art and philosophical practice, and social-political awareness. Anchored in her examinations of the experiential and experimental are spatial and topographic considerations of light, sound and color. Her sources lie in literature, philosophy, technology and cultural phenomena. Senstad has exhibited in the Venice Biennale in 2015 and 2013 and the Bruges Art and Architecture Triennale in Belgium in 2015. Upcoming projects and exhibitions include a commissioned public art light sculpture for the Bruges public Library in Belgium to be unveiled August 2017, and a solo exhibition at the Venice Biennale 2017 at the Centro Culturale Don Orione Artigianelli. 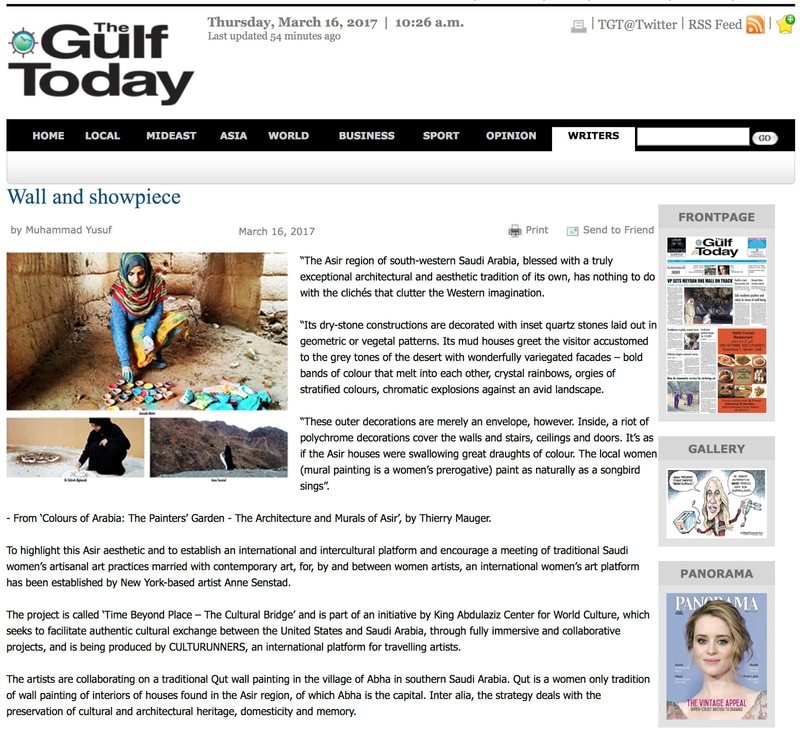 Her video work has been shown at Centre Pompidou, Paris, Haus Der Kultur Der Welt in Berlin, Beirut Art Center, Lebanon, The Canadian Museum of Nature, Museum of Modern Art Ukraine, Dallas Aurora, Video Arte Internacional Buenos Aires, Eva Peron Museum, Oslo Screen Festival, Views Bahrain under the patronage of H.E. Shaikh Rashid bin Khalifa Al Khalifa, and ISEA Dubai 2014 amongst others. Having studied Fine Arts at Central St. Martin’s College of Art and Design in London, Ghada Da’s multi-disciplinary fine art practice focuses mainly on performative sculpture and video installations. Her durational work is a journey of observation on the relationship of the body to space, its disconnect and rebirth. Exploring the genderless body is at the core of her practice. The main aim of Da’s work is an investigation of the visible landscape presented by the body and the spatial area in which the body exists as well as its invisible counter part: the psyche. This helps her create a dialogue with the body and understand its complexity. Da tends to create images that become psychological portraits of the identity of the human condition by either an intentional mutation or an intersex by design, in order to allow the sculptural body to live outside the gender system. Da is from Saudi Arabia and is currently based in Dubai, UAE. Her works have been shown locally and internationally including: Shanghai Duolun Museum of Modern Art, Shanghai, Pon Ding Gallery Taiwan, Seoul Art Space Geumcheon, Seoul, Sharjah Art Foundation, Sharjah, Saatchi Gallery, London, Satellite Space, Dubai amongst others. 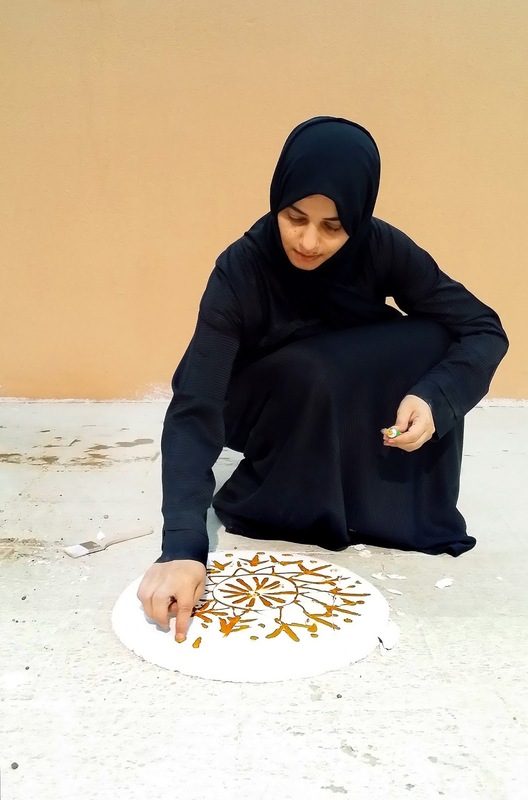 Dr. Zahrah Alghamdi gained a doctorate in Design and Visual Arts at Coventry University in Britain and is Assistant Professor at the Faculty of Art and Design at the King Abdulaziz University. Alghamdi grew up in South-Western Saudi Arabia surrounded by traditional domestic architecture. In her current work, she reaches back to the memory of these spaces along with their personal associations and wider cultural significations. By creating an echo of the past, she brings this past into contact with the present, seeking to demonstrate changes of style in architecture from traditional techniques, materials, and resources. Even if we demolish buildings from the past, ‘home’ will not be destroyed, but will live on in tangled and complex ways, through the memories of people who have lived in these spaces. ‘Home’ for me is bound with the architecture of my memory. In the development of new architecture’s regional styles, materials and techniques have been lost. It is this loss that she aims to engage with in her work. 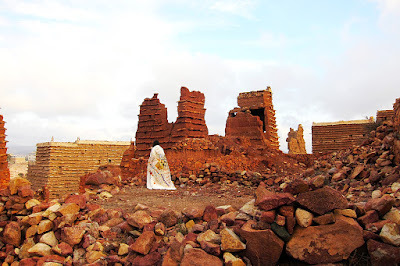 Jameela was born in Tabuk and grew up in Abha. She comes from an artist family who have for generations worked with the traditions of Quat painting. The family encouraged her interest in art from a very young age, and she found herself drawn to patterns and colors which she has developed research on the relationship between traditional and contemporary art. Her education in the field of physics with an emphasis on the science of color influenced her work from the early stages of her art practice. 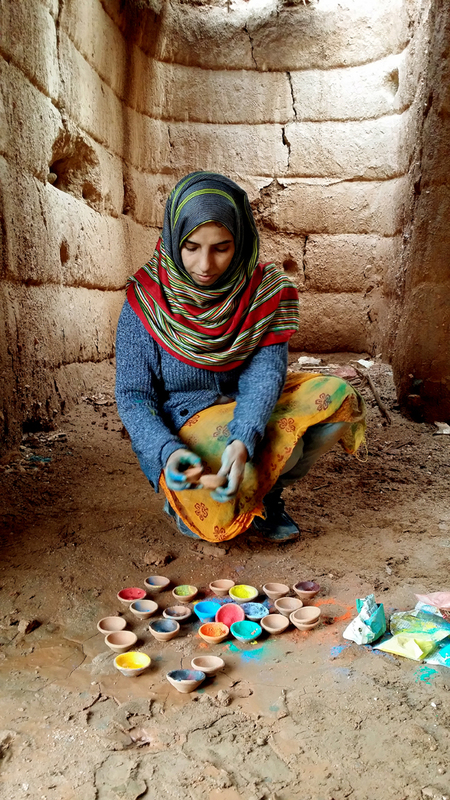 Jameela has developed a unique system for creating color pigment, using high-quality natural materials and pigments such as honey, ground stones and plants. 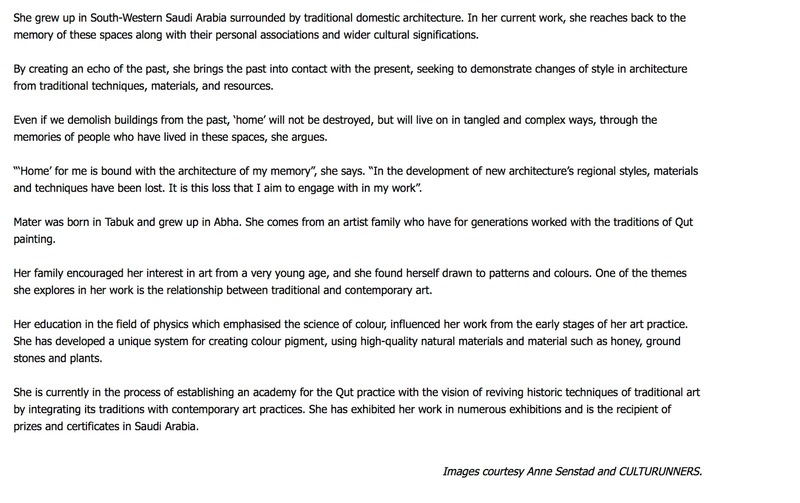 She is currently in the process of establishing an academy for the Qut practice with the vision of reviving historic techniques of traditional art by integrating Qut traditions with contemporary art practices. She has exhibited her work in numerous exhibitions and is the recipient of prizes and certificates in Saudi Arabia. The King Abdulaziz Center for World Culture, simply known as ithra, is a one-of-a-kind institution that brings together multiple offerings under one roof. From arts and culture to science and innovation, this bold initiative by Saudi Aramco promises a continuous journey of enrichment designed to energize the next knowledge economy of Saudi Arabia. ithra aims to make a positive and tangible impact on the cultural scene by focusing on building local talents in the knowledge and creative industries. Blending iconic architectural design with advanced technology, and unique learning methods with enriching programs, ithra is an infinitely inspiring platform for explorers, learners, creators, and leaders – a thriving hub of knowledge, creativity and cross-cultural engagement. As the Kingdom of Saudi Arabia strives to achieve its ambitious national development goals to transition to a knowledge-based economy, ithra acts as a bridge connecting cultures and cultivating a creative and innovative community and invests in the power of people and ideas to unlock new possibilities.